“It just isn’t fair!” Is that the way you feel sometimes? So your friend gets A’s in math without even trying while you struggle to get a C. Or your family is poor and can’t afford the nice things your classmates have. Maybe you long for a happy family like the one down the street, but instead your parents have divorced and you spend lots of time alone. No, life is not always fair—at least not in the way we measure fairness. 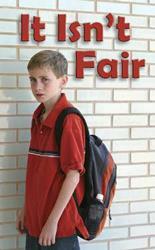 Is it fair that some children are born handicapped and may never walk or talk? Does it seem fair if your best friend gets cancer or your dog gets killed? It’s easy to become angry or bitter when life doesn’t seem fair. We may feel cheated or wonder whether there is a God who cares. But God is there. He does care. And yes, He sometimes allows things to happen that do not seem fair. But God in His wisdom always has a reason for what He allows. Nearly 2,000 years ago an innocent man was nailed to a cross. He never did anything wrong. Yet His enemies accused Him of evil and killed Him. That man was Jesus. Jesus, the Son of God, knows what it is like to be rejected. Even His own brothers made fun of Him. Jesus knows how it hurts to be betrayed by a friend. He felt the pain of a cruel death because of wicked men. But Jesus did not say it wasn’t fair. He did not try to get even. Instead, He asked God to forgive those who hated Him. Was it fair that Jesus had to die? His friends did not think so. But later they learned that God allowed Jesus to suffer and die so that He can forgive our sins. Jesus rose from the dead and went back to Heaven. But He also wants to be with you wherever you are, even though you do not see Him. Do you feel hurt or rejected or lonely? Has someone lied about you? Tell Jesus. He understands. Like Jesus, let the unfair things you experience make you strong. Trust Jesus to help you. You will fing that He makes life worth living. Then you can help others learn to trust Him too. Jesus dearly loves you and cares about what happens to you. If you love and obey Him, He will take you to Heaven some day where you will be happy with Him forever. Then you will understand those things that don’t seem fair now.